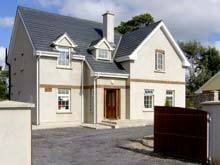 The Ivy is a four bedroom detached house in the heritage town of Lismore, county Waterford, Ireland. The Ivy is newly constructed to the highest standards just a stones throw away from the lovely old town centre of Lismore. The house has 3 double bedrooms and 1 single. The master bedroom is ensuite, and there is great family bathroom for the other guests. The bedrooms all have polished wooden floors and the comfortable beds have crisp white linens. more cosy on winter evenings. There is 48 inch hd plazma satellite TV and a DVD for your entertainment. The dining area is connected to the kitchen and also to a large sunny patio, via french doors. The kitchen is very well equipped with full size electric oven, microwave, grill, dishwasher, coffee maker and toaster. The separate utility room houses an automatic washing machine, clothes dryer, iron and ironing board. There is also a small office area complete with Broadband Internet connection,also WIFI. There is a 4ft single bed in this room. The Ivy has beautifully landscaped gardens, offering you seclusion and privacy. The Ivy is a dream house and a perfect base to escape from the real world and to visit gracious Lismore Castle castle gardens and Art Centre. Nearby you'll also find the spectaculr drive through the Vee valley, Mount Mellary, the Balckwater Valey garden trail and lots of other places of interest. The Ivy is within easy walking distance of Lismore town centre, the Castle, the river Blackwater, lovel restaurants and great pubs. There are lots of activities available in the area including Lismore's famous Salmon and other fishing, horseriding, golf ,walking trails and hill walking . The nearby town of Fermoy has a swimming pool and a gym, and of course the beaches of The Irish Riviera nearby Dungarven,Ardmore and Youghal.